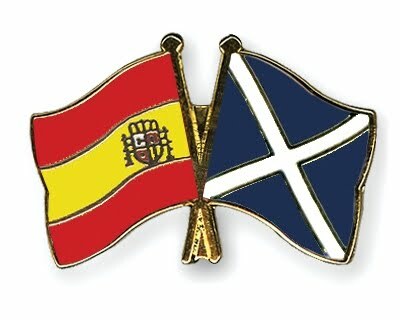 A Scotsman in España - Erasmus 2011-2012: 2nd Semester and a trip to SALAMANCA! 2nd Semester and a trip to SALAMANCA! Well it's been ages since I last posted an article and I feel very guilty about that. I've been finding it very difficult to find the time to do things for myself here in Murcia that are non-university related and when it's time to relax, it's not time to write articles :P Anyway, despite the moody tone of that last sentence, I'm really enjoying my second semester at uni here in Spain. Now that we're into March the weather has started to significantly improve and we're now into the 20 degree territory...happy days! Being home for Christmas was fantastic. Seeing my friends and family again after many months was a great help although I was lucky to have had a couple of visits from friends during the first semester. Glasgow was all lit up with Christmas lights and this year I managed to make a trip to George Square to take a ride on the ferris wheel. I'd love to say the cold was a welcome break but I would be lying, I'll definitely miss the good weather when I leave Murcia. Over the past few weeks I've been juggling university work with parties and trips. I've been to London and Salamanca and this weekend I'm off to a town called Elche, which is next to Alicante in the southeast of Spain, to have a guided tour and go ice skating! Such fun! 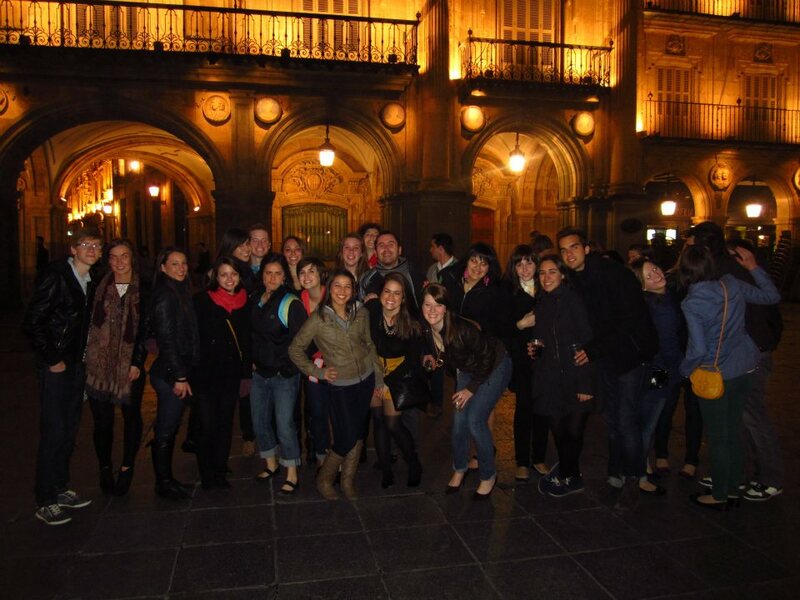 The trip to Salamanca was something I will never forget. The city itself is beautiful and there are hundreds of choices for food, drink and entertainment. The local gastronomy is excellent and, for the most part, very cheap. One day we had a deal for 3 tapas dishes and a drink (beer, wine, water) for 4 euros (picture below). You can't beat that, can you? http://www.youtube.com/watch?v=uC2iTX3UzHQ) and over 1000 erasmus students from all over Spain participated in the event. We did tours of the city, ate, drank, partied, competed with other cities in various games, did a flash mob in the Plaza Mayor (see video) and had a Gala dinner with music and dancing with all of the students gathered in one hall. 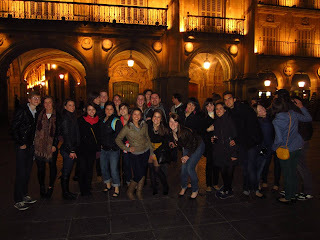 I am so glad I went on the trip organised by the local ESN Murcia group (Erasmus Student Network) and I would definitely recommend a visit to Salamanca to anyone, young or old. Hi! I love your blog and your exchange experience stories. I’d like to inform you about an intersting project… Could I have your contact? that is posted on your site.Keep the tips coming. do not recognise who you might be however definitely you're going to a well-known blogger if you happen to are not already ;) Cheers! Thanks for the article, can you make it so I get an alert email when you write a fresh article? I often do! I get pleasure from studying a post that may make individuals think. ideas that can help me. Thank you! know who to ask. Glimpse right here, and also you’ll positively discover it. the aid of your site. I'm certain you've never met any of us. magnificent post, very informative. I'm wondering why the other specialists of this sector do not notice this. week. Your humoristic style is awesome, keep up the good work! open the links. You might add a related video or a related picture or two to get people interested about what you've got to say. Just my opinion, it would bring your posts a little bit more interesting. realize this. You should continue your writing. I am confident, you have a huge readers' base already! Lady gaga! Your own stuffs outstanding. All the time deal with it up! his studies while using the ideas he got while using the site. seriously serious. Many thanks for all! fantastic post, very informative. I ponder why the other specialists of this sector don't realize this. You must continue your writing. I am sure, you've a huge readers' base already! I’ll be informed plenty of new stuff proper here! Good luck for the following! There are actually numerous details like that to take into consideration. I've been surfing on-line more than three hours lately, but I never found any interesting article like yours. It is lovely worth enough for me. Personally, if all webmasters and bloggers made just right content material as you did, the internet shall be a lot more useful than ever before. of the teхt in your content are running off the screen. An impressive share! I've just forwarded this onto a coworker who was conducting a little homework on this. And he in fact bought me dinner simply because I stumbled upon it for him... lol. So allow me to reword this.... Thanks for the meal!! But yeah, thanx for spending some time to discuss this issue here on your web site. Hello great website! Does running a blοg simіlar to this take а large amount of work? I've absolutely no understanding of coding but I was hoping to start my own blog in the near future. Anyway, should you have any ideas or techniques for new blog owners please share. I know this is off topic however I just had to ask. Thanks! cheap car hire italy hertz you have presented in your posting. They're really persuasive and will certainly get the job done. Nevertheless, the postings tend to be very brief for beginners. Could you please stretch them a little from next time? However, thank you for the article.